Really, Pantani: The Accidental Death of a Cyclist should have been a better film. The constituent parts are so strong that the documentary could have almost made itself: A modern day story with the narrative arc of classical tragedy; reams of historic footage with electrifying sporting battles across breathtaking vistas; and newly conducted interviews with family, insiders, expert observers and grand tour champions. This should have been a five-star sports documentary of an equivalent calibre to Asif Kapadia’s Senna. Yet despite a promising start, James Erskine’s Pantani misfires, strangling a narrative which could have spoken for itself with cheap and unnecessary stylistic ploys which become increasingly irritating as the film progresses. Further, some of the tough questions that need to be brought to the story are raised only fleetingly and insubstantially towards the film’s conclusion. The film starts off strongly enough, establishing the intersection of mountains, speed and suffering, which define grand tour cycling. At this early point the film seems pretty slick and it’s exciting to see footage of, and even brief interviews with, Pantani in his youth. Pantani’s specialist climbing skills were evident from his earliest cycling days and the promise he showed also pointed towards a way out of economic disadvantage for his family. But it’s at this early stage in the film that stylistic decisions begin to detract. Accompanying the story of Pantani’s first racing bike, paid for in part by his grandfather, we see an awkward dramatisation of the young Pantani with the bike and his grandfather. Automatically I was transported to the made-for-tv Il Pirata: Marco Pantani, which I described here earlier in the year. These dramatisations persist throughout the rest of the film, usually shown obliquely, with the actors face out of shot or out of focus, sometimes in a split screen montage, and always unnecessarily. In full flight, tearing up the mountain climbs of the Giro d’Italia or the Tour De France, Pantani was a sight to behold. It stands to reason then that using this footage would be a natural trump card for constructing the dramatic tension of the film. Sure enough, footage of Pantani’s first spectacular attacks at the Giro are used in this way. 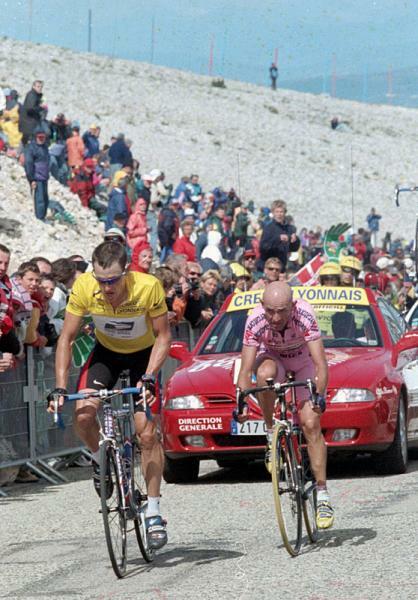 Similarly, and after some very interesting footage of Pantani’s recovery from the crash which could have killed him in 1995, we see his audacious attack in the rain on the Col du Galibier to win the scandal-marred 1998 Tour de France. But by the time we reach his iconic duel with Lance Armstrong on Mt Ventoux during the 2000 Tour de France, Erskine has decided the footage alone isn’t exciting enough and instead we watch the action in a series of stills, replete with camera-shutter sound effects as each shot advances. Maybe they couldn’t get the rights to the footage – but it fits with a move towards clumsy stylistic tricks which seem to be laid on increasingly as the film progresses. When some historic interview footage is used, instead of simply showing the footage we see it overlayed on a TV screen in the corner of a room. 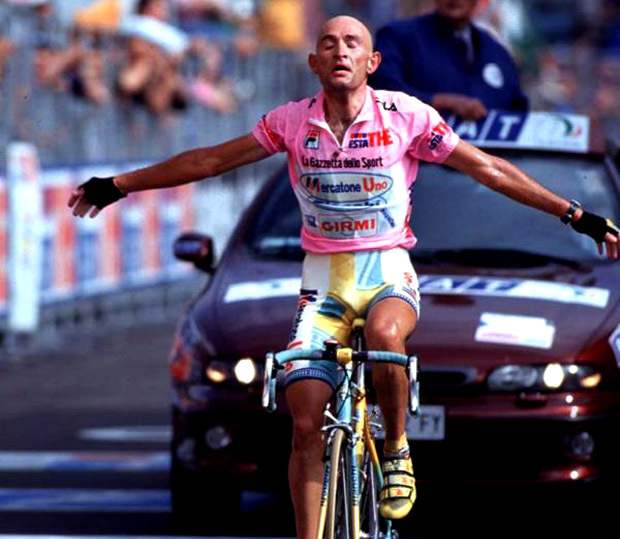 After Pantani falls from grace we see his sunglasses falling to the floor in slow motion – again and again. A motif of spinning test tubes, dissolving to a spinning bicycle wheel, appears with similarly frustrating repetition. Also, each section of the film is marked by a title screen with a quotation which might seem poetic if allowed to stand independently, but in each case the quotation is part of the ensuing dialogue with interviewees – it’s oddly dissonant. The sum total of all these quirks is a squandering of the archival material’s inherent strength and an insult to the intelligence of the audience. To this point my criticisms are levelled at problems which could be completely fixed with editing – if only I was in the test audience! But a film about Pantani necessarily has to be a film about drugs in sport, about ethics, and about who the heroes and villains are who emerge from these complexities. All of this is inadequately covered. Anyone unschooled in cycling history might be able to leave this film thinking Pantani was possibly innocent and the victim of a vast conspiracy. 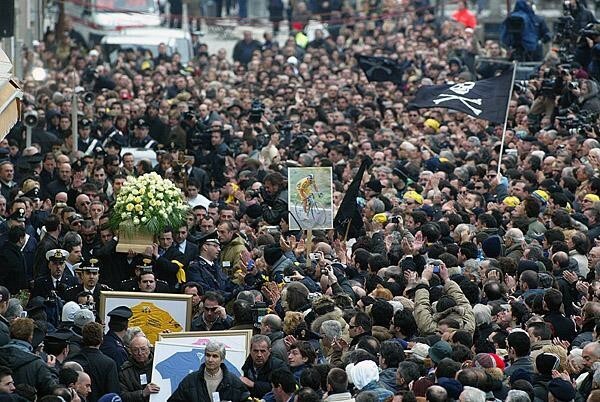 We hear about the arbitrariness of EPO testing, the frustrations of race organisers with Pantani’s dominance, and the sinister inside knowledge of bookmakers, alongside a scarce mention of Pantani’s connection with Operación Puerto. There’s no doubt we are tempted to sympathise with Pantani’s plight in a way we are unlikely to ever feel about Lance Armstrong. Why? Because Armstong was a bully who made millions whilst Pantani was a nice guy who got destroyed and died alone? That’s got to be a part of it, but that also remains too simplistic a conclusion and one a serious documentary film should really attempt to expand. Only momentarily does the film start to point towards answers as it glances at the profiteers of pro-cycling. As the saying goes, a fish rots from the head down, but that doesn’t mean we necessarily need to identify conspiracy either. It inheres in the simple logic of capitalism, of competitive accumulation, that an advantage must be sort. All the more so the greater the power and profit at stake. In this context modern sport embodies a contradiction – on one hand existing as a distillation of the most aggressive components of capitalist ideology, whilst simultaneously coupling this to notions of fair play and cooperation. Nevertheless this contradiction is not so strong that the competitive imperatives, and their economic corollaries, are ever anything but preponderant. For that reason there will always be drugs in sport and it would be naive to think otherwise. Similarly, there is always some level of hypocrisy in anyone who wants to profit from sport whilst condemning drug cheats. It should come as no surprise, as was revealed this week, that Oakley knew about Armstrong’s drug use all along, whilst only severing ties with him at the end of 2012. The press isn’t too bad for Oakley – tomorrow the 2014 Tour de France begins with Chris Froome, in his Oakley sunglasses, as overwhelming favourite. Riders get destroyed whilst the capitalists they essentially dope for keep raking it in. Towards the end of the film one interviewee describes Pantani as an ‘instrument of cycling’ and whilst this is part of the soft and sympathetic approach the film takes to Pantani’s guilt, I think it is, in terms relative to Armstrong, essentially correct. Armstrong succeeded in positioning himself in the networks of power that more typically exert an externally controlling influence on riders. So if we feel intuitively that Pantani has less to answer to morally than Armstrong it might be because Armstrong constructed and wielded power, whilst relatively at least, Pantani was controlled by it. Lastly, Pantani’s mother, who provides some of the most touching interviews in the film, says towards the end that ‘sport is meant to be beautiful.’ To my thinking, as should be clear from what I’ve written here, this misunderstands what sport is. Nevertheless, as part of the contradictory nature of sport, there are undoubtedly moments of beauty within it. Watching Marco Pantani elegantly ascending the mountain climbs of Europe is an example of such beauty – and of such beauty as to outweigh the moment’s attachment to surrounding corruption. When we think of Pantani, that’s the moment we can hold on to, fixed with a meditative quality of purpose and freedom that captures what’s good about cycling. 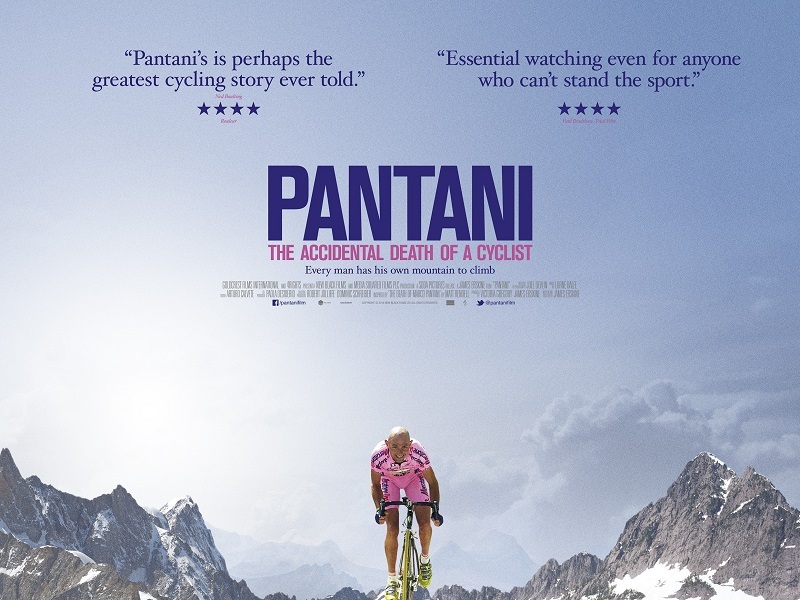 We saw Pantani: The Accidental Death of a Cyclist at special cinema screening last night. As far as I know there is no wider cinema release for Australia but the DVD is out July 30. That movie review was excellent… so much so that I think you must have been juiced up to write it. This was evident due to your much higher than normal word count. The masking agent of beautiful inset pictures in your review was also detected. I suspect you will have to submit a random prose sample to authorities. The distinction between Roleur and Rapha is blurred too: To the best of my knowledge Rapha started the magazine before spinning it off whilst remaining its major shareholder. The trailer is hosted on Rapha’s youtube account too. Inspiring ….Great human story of Courage.